The largest extractor of natural gas in the world, Gazprom, has been riding high and mighty on the waves of increasing commodity prices and limitless amounts of borrowed money. But what goes up may come down and now the gas giant has to deal with a crippling debt burden, reduced revenues and an overdue investment program. How will the company weather this storm? Gazprom, 50.002% state owned, became the 3rd largest company in the world by market capitalization two years ago. It accounts for almost 10% of Russia’s GDP and generates close to 25% of the country’s tax revenues. But the significance of Gazprom goes much further than that. The company plays a strong symbolic, social and diplomatic role in Russia. The moment when Gazprom’s former Chairman, Dmitri Medvedev, was sworn in as president of Russia in March 2008 only confirmed this special significance. But its special status has not shielded the company from the harsh realities of the international economic downturn. Gazprom entered the financial crisis with a $60 billion debt, making it Russia’s most indebted company. This debt needs to be serviced to the tune of $7 billion in 2009 and over $11 billion in 2010. In addition, Gazprom has a $29.4 billion investment program planned just for 2009. By 2020 Gazprom is supposed to invest $500 billion into gas production and transportation. With this strain on its finances, a fall in revenues is the last thing Gazprom can use. But gas prices are expected to fall to an estimated $260 to $300 per thousand m3 in 2009 compared to an average of $420 in Western Europe last year. At the same time, the crisis has led to a fall in gas consumption in the EU. Gas use in the EU fell 16% this winter in some of the EU’s larger economies despite rather cold weather. Gazprom sells one-third of its gas to the EU but this one-third generates more than two-thirds of its revenues. Then there is Ukraine, which totters on the verge of bankruptcy. A deferral of payments by Ukraine and consequently a new gas conflict may be closer to reality than Gazprom wants. The January crisis cost Gazprom $800 million in lost revenues. Thus, Gazprom has a great need of money, but financing is drying up. Raising cash through additional share issues is not a realistic option as Gazprom has dropped from its place as the 3rd biggest company in the world to number 35 on the list. Moody’s has now cut Gazprom’s debt rating one level to Baa1, the third-lowest investment grade. 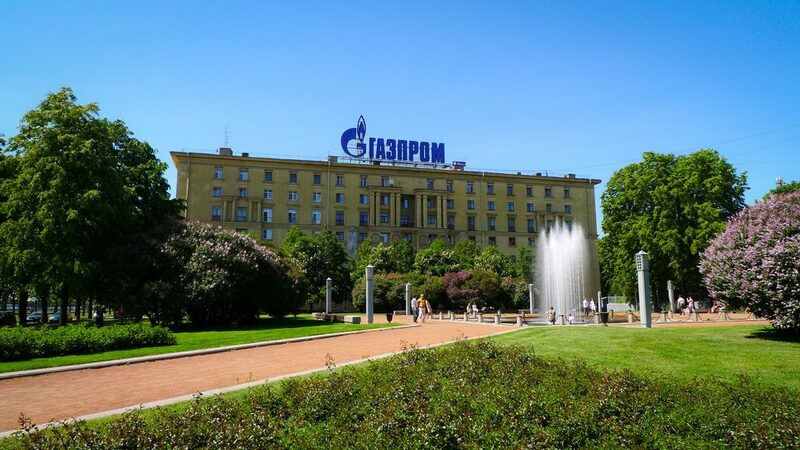 In spite of all that, Gazprom may come out of the crisis stronger than before. With the interest of the Kremlin in the company, one can be sure that Gazprom will always, in the end, have the funds that it needs. It is simply too big to fail. The low market capitalization of Gazprom is to a certain extent the result of investors fleeing emerging markets and not so much the result of a lower intrinsic valuation of Gazprom. When capital markets rebound so may the share price of Gazprom as well as its possibilities to attract international debt. And with the EU, Gazprom has a client hooked on its product. Gas will remain the EU’s preferred energy source for many years to come. So, those waiting with glee for mighty Gazprom to fall should not draw conclusions too quickly. The stumbling giant may come back with a vengeance.